in the round, in St st using larger needles, after washing. 61¾" (157 cm) chest circumference and 27¾" (70.5 cm) long. 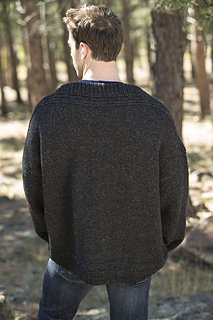 The design for the Broc Sweater was inspired by both the traditional, textural one-color fishermen’s jerseys, or “ganseys,” and the Estonian Vatt, or knitted jacket. Traditionally Vatts were knitted by brides and given as gifts to their bridegrooms. Vatts were usually black and knitted in a textured relief pattern, or nuppiline stitch. Although Vatts were traditionally knitted on two needles, felted, and then sewn together, I thought that the simplicity of the Broc Sweater would make an interesting and easy project in which to introduce the use of steeks. The steeks are incorporated as you knit and are then reinforced and cut to make the armholes. 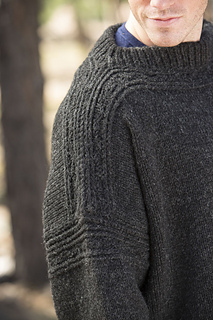 The Broc Sweater is knitted in the round from the bottom and has decorative Estonian nuppiline relief-stitch patterns between twisted braids at the lower edge and across the shoulders. 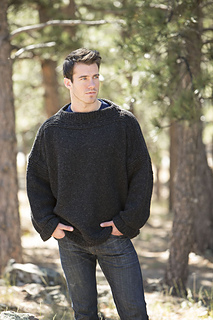 It is knitted in a chunky pure Shetland wool, and the steeks are reinforced using a four-ply pure Shetland wool yarn. Size U.S. 9 (5.5 mm) two 16” (40 cm) and one 40” (100 cm) circular (cir) and set of 5 doublepointed (dpn). Adjust needle size if necessary to obtain the correct gauge. Marker (m); holders or waste yarn; size 2 mm (no equivalent; between U.S. 1 steel and B-1) crochet hook; tapestry needle.